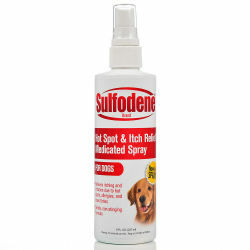 Relieves itching and skin irritation due to hot spots, allergies, flea bites, and insect bites - now in a convenient spray. This gentle, non-stinging formula provides immediate relief for hot spots, scrapes, and abrasions. Spray 6 to 8 inches from affected area, avoiding eyes or mucous membranes. Use as often as needed for continued relief. Do not use on puppies under 6 weeks of age. If symptoms persist, please consult your veterinarian.